Break up ice with ease with this 1 point ice pick! With a single sharp hardened steel point, this ice pick will break chunks of ice from your freezer, ice machine, or other source almost effortlessly. This pick's wooden handle provides a comfortable and sturdy grip for users. Boasting extreme sturdiness and strength, this ice pick will not let you down. Not only is this good for breaking up ice, it works on other items as well, such as frozen bulk foods! I've had this ice pick for about two weeks now and have been giving it some heavy use. It's a sturdy, well built ice pick. The cover fits snugly onto the pick without any wiggle indicating it could fall off. Need to take our some aggression? This ice pick is the perfect way to do it! Stab a block of ice, make it into smaller chunks. Just don't stab your hand or the freezer. First, the picture does not show that this comes with a little black shield on the tip, which is great for safety and it will not scratch whatever receptacle it is held in when not in use. After all there is nothing worse than a scratched up polycarbonate food pan and an inspector telling you to replace it. The Ice Pick itself worked great for us, and I probably will buy a few more to just keep on hand. Great ice pick! It comes with a small cover for the point, which is awesome for storing it. I use this bad boy on those bags of "crushed ice" that are always stuck together, and it gets the job done! Affordable ice pick gets the job done quickly and easily. Who doesn't love a great deal. Comfortable handle makes breaking apart large chunks of ice a breeze. Many times ice coming from an ice machine may be frozen together. This ice pick allows you to break the ice apart without hurting your fingers or hands. We do suggest handwashing this tool to ensure a longer life. The wooden handle is easy to hold and the pick is made of stainless steel. I really love this wooden handle single ice pick it really gets the job done at breaking up ice now all my ice is usable great product and value! 1 Point doesn't cut it depending on what you are trying to chip at. I'm gonna order a 3 point ice pick to see how it works. I could just be using it with poor technique. It is a simple tool and constructed as such. This actually works well but I think the quality isn't as great as our last pick. The cap on the handle is just screwed on and unfortunately it isn't magnetic so no chance of hanging it on the knife rack. I love this ice pick for breaking up chunks of ice for drinks. Its a much cooler look with the jagged edges as opposed to just regular cubes. Very cool ice pick!! Works well and easy to hold, especially for those with small hands. Chips ice well and cleans well too- I would recommend. Perfect for frozen foods. We don't really have any other use for it but its a nice item to have when needed. The quality is good. Definitely a great value. I have had this product for around 4 months now, and have used it regularly (around 8 hours a day) at our store and the product is still as good as new! Highly recommended! this ice pick really works swell. it shatters ice nicely, and sometimes, if there is frozen things stuck together, i use it in those situations. This was just what I needed! The ice pick is sharp enough to get the job done. It has a nice wooden handle to hold onto and breaks apart the ice in small chunks. Tired of ice chunks, I grabbed this to make sure I could break up ice whenever needed, and it does just that. Nice to Have on hand. My initial impression is that this ice pick seems very durable and well made. I've used it a few times already and don't see anything wrong with it. The point is sharp enough to do the job but not too sharp to accidentally cut yourself on it. We well see how well it holds up over time. But for now I'm happy with it especially considering the price. Strong, sharp and works like a dream. The wooden handle makes it look classy and is the envy of bartenders in the area. I will get extras for backup for sure. The ice from my freezer gets stuck together very easily, so I thought it would be worth buying one of these. It's well made and does the job. Good price, too. 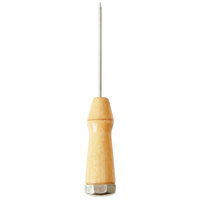 You can also use the 1 Point Ice Pick to open up wood glue that has sealed itself shut with glue. The tip is so sharp and sturdy that I'm easily able to pry the glue off of the tip and begin using it again. Glad for the purchase. Previously I was using my ice scoop to break up the ice and that doesn't really do the job that well. It works, but it takes a lot of effort to break down the ice with a scoop. Then the ice pick came in to town and it is a godsend, I wind up using it a lot more than I initially expected. It effortlessly breaks up large chunks of ice, it seems to be pretty durable too. My only gripe is that the little rubber cap that goes over the tip is very easy to lose, I keep this pick in my bag when I bartend and I hope it doesn't poke any holes in it. This is bound to happen though and it's not the fault of the ice pick, but my negligence. A+ ice pick! Works great and is very durable. Easy grip handle makes it easier to use and we don't have to worry about injuring ourselves with it's simple use. very nice sturdy ice pick at a give away price! however, do not put it in the dishwasher because I did this with a previous one that was exactly the same, and the coating wore away at the tip. This is an ice pick of very good quality. Its sharp metal point and wooden handle makes really easy to break chunk of ice. Because it is so handy I consider to try ice carving someday. I bought this product over a year ago. I have not had any issues. Good quality, good price. I recommend this product for you bar or business. Nice 1 point ice pick. Made with a wooden handle and a stong metal point. Breaks Ice quick and easy. This pick is a good price. I finally ordered a replacement ice pick to the one I've had for over 20 years. Surprisingly, this one is very sturdy and of great quality. I'm so glad I found this here! Good quality ice pick. Handy piece to use on big, clamped ice pieces for our bar drinks. Also safe to store because of the tip cover it comes with. And low price is a bonus. Great for breaking frozen cheese, pureed lentils, ice, etc. Good quality but low price. It is very sharp so i'm glad it comes with a tiny cover for the tip. Must buy for ice in summers. I bought this to give ice carving a try and was VERY impressed with the quality and strength of these tools. Though I wasn't any good at sculpting I now use this to chip away built up ice in my ice maker. This is a wonderful, strong and handy ice pick. We use it a lot for breaking up ice chunks in the ice machine. Every now and then when we get a special request, it makes for great accuracy when creating an ice sculpture. The Heavy metal,wood handle hard steal poin 4 1/ 8" long, 1 point ice pick. It is great for many reasons. Chopping up chuncks of ice, as well as other things. Every home needs an ice pick or two price is right. The 1 point Ice Pick is great. Features heavy metal with wood handle, hard steel point 4 1/8" long. Works great when ice is clumped together, to seperate. This is a great tool for an ice carver. Very durable and worth the price especially if youre ordering in bulk. I would recommend these time and again! Gets the job done. The Ice pick has a great durability and is affordable for it's low price. It's great for breaking up large chunk of ice but be careful using it. This ice pick is great for breaking up ice clumps,so you can serve in glasses,and also good for opening bedroom doors a very handy tool,at a great price. Great ice tool! WOrks great for effortlessly breaking down large chunks of ice. Works well for making crushed ice from solid blocks of ice. Affordable price. Great value!! !